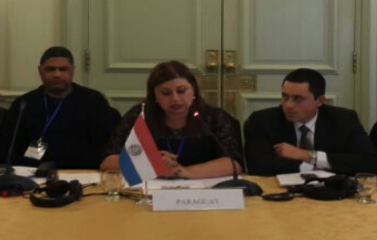 Yudith Rolón is General Director in the Directorate of Truth, Justice and Reparation of the Office of the Ombudsman, Paraguay, and Focal Point in the Latin American Network for Genocide and Mass Atrocity Prevention. 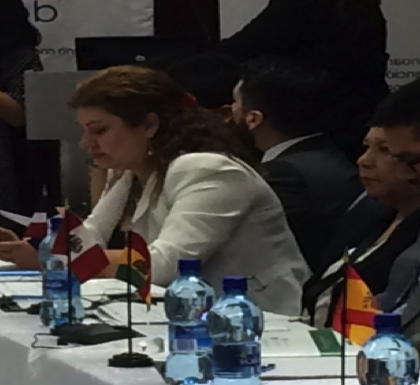 She attended the Latin American edition of the Raphael Lemkin Seminar for Genocide Prevention in June 2013 (Poland) and June 2014 (Argentina). 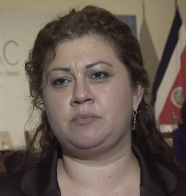 Why are you dedicated to the field of genocide and mass atrocity prevention? I am a human rights activist in my country, Paraguay, because my family suffered all kinds of human rights violations during the 1954 – 1989 dictatorship. My family endured a wide range of cruelties, including my father—a victim of forced disappearance since 1976. My brothers and I were held in a detention center and my relatives were exiled and tortured. I joined the Truth Commission and listened to the voices of thousands of people, including many from native communities, who went through all kinds of atrocities. I’ve committed to work towards “Never Again” in my country. This has led us to join forces in a world where prevention is key. The visit I made to the Auschwitz concentration camp in Poland through the Auschwitz Institute’s Raphael Lemkin Seminar was crucial for both my interest and devotion to the work I now do towards genocide and mass atrocity prevention. The events that occurred 70 years ago still hurt—they have left traces of humanity’s perverse deeds. This fact reaffirms my commitment to genocide and mass atrocities prevention, which should be a collective obligation. We must work together to prevent and achieve a future in which genocide never occurs again. What I lived through in Paraguay and in the Southern Cone of Latin America with Operation Condor, as well as my visit to Auschwitz, will always remain in my memory. What actions and policies do you feel are most effective in the long-term prevention of atrocities? In Paraguay, none of the historical events have been characterized as genocide and/or mass atrocities. We endured two big wars—the first from 1865 to 1870 with Argentina, Brazil and Uruguay which left Paraguay devastated with a nearly an extinct population and then with Bolivia from 1932 to 1936—and a civil war in 1947. We also faced the civil-military dictatorship of Alfredo Stroeesner for nearly 35 years, from 1954 to 1989. All of these events are marked by death, and their enormous consequences. Even more, they are characterized by the social perception that my country’s ethnic groups are unprotected and do not receive the humane treatment they deserve, and that since before and during the dictatorship, there were communities that suffered crimes against humanity which could be considered genocide. I think the Latin American Network for Genocide and Mass Atrocities Prevention and the Network Focal Points are on track in driving States to assume their role of guaranteeing citizen protection, in establishing a policy of education for students, faculty, government officials, security forces and other stakeholders, and in raising awareness and training on the prevention of genocide and mass atrocities. We must develop educational programs to teach future generations the lessons of the Holocaust in order to help prevent future acts of genocide. – Ensure and establish mechanisms for citizen participation designed to gather input, suggestions and recommendations of public policies to be implemented in the prevention of genocide and other mass atrocities. A special emphasis on the participation of vulnerable groups should be made. – Promote the investigation process and sentences of those responsible for crimes against humanity committed in the country, and strengthen internal bodies within the structure of the Judiciary and the Public Prosecutor’s Office in respect to prosecution and punishment. – Create strategic alliances with countries and multilateral organizations abroad on the prevention of genocide and mass atrocities, and strengthen the Latin American Network. 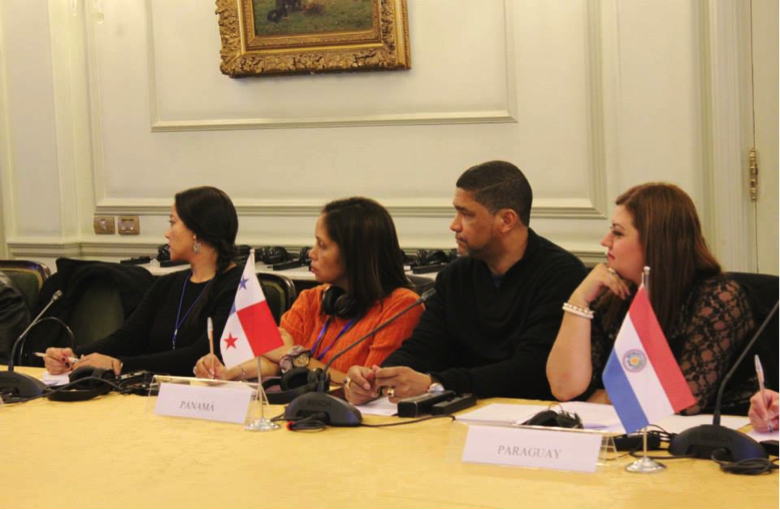 – Work on implementing an early warning system, monitor compliance of international commitments made by each country and, in Paraguay, continue to promote the creation of a National Mechanism for the Prevention of Genocide and Mass Atrocities by national law. Do you believe that your work has impacted a person or a group of people? If so, how? – Influencing public policy for human rights. I always say there is in Paraguay a “before” and “after” the Truth Commission. Today, there exists an official truth that is indisputable, and some 177 recommendations to be implemented by the State, one of which is prevention. Always bear in mind that the best legacy is Collective Memory—remembering the events that occurred in the past contributes to ensuring they are not repeated again. How would you describe a day or a week at your work? Every day I thank God for the opportunity to pursue new challenges to overcome. My days are filled with many activities, including meetings with victims’ organizations and coordinators, receiving victims, family members and officials, maintaining international relations electronically, scheduling and traveling in the country or abroad, monitoring targets, preparing reports, and visiting places of memory. 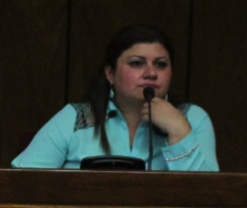 I am also a mother and activist in social and political organizations, which makes my agenda full. I am always encouraged to think that we are building routes for tomorrow, and paths that contribute to strengthening the weak democracy in Paraguay by seeking a culture of memory and peace. I firmly believe that we are spokesmen for the most vulnerable people. What is it that makes you feel the most proud of your work? As I said before, I am the daughter of a militant who gave his life for the freedom and democracy of my country. My biggest challenge is to continue with this struggle because through this work I honor the memory of my parents and my fellow citizens who have been victims of state terrorism. I am proud to meet many people around the world who, like us, fight for the dignity of people. It is good to know that we are not alone and that, together, we can start building tools for the future: a social contract between civil society and the state, weaving the same aspirations to eradicate poverty, social exclusion, discrimination, hatred, racism, xenophobia, genocide and mass atrocities. The most important thing to effectively carry out a genocide prevention program is the commitment and passion that has to be put into your work. Learning and training is also essential. For this to happen, human, financial and technical resources need to be allocated. Another important quality includes the transfer of knowledge between a qualified official to one at the entry level.